Since 2005, Gutter Helmet of the North Bay has been installing the highest quality gutter protection system on over 1500 homes in the greater San Francisco Bay area. Gutter Helmet of the North Bay is a full seamless gutter installer and specialty roofing specialist as well so we can take care of all your water management needs. We are family owned and operated and we focus on professionalism and absolute customer satisfaction. Gutter Helmet is the first choice of many homeowners across the country when it comes to keeping your gutters clog-free. With its revolutionary nose-forward design, clutter-causing debris is kept out while rainwater and snowmelt safely flows down your spouts unobstructed, preventing problems such as ice dams. Gutter Helmet gutter covers are designed with durability in mind, and are built to last for years with low maintenance requirements. To ensure the quality and performance of our product, GH of the North Bay relies on its team of highly-trained professionals, each with years of experience in installing Gutter Helmet gutter guards to exact manufacturer specifications. In line with our dedication to providing good service, our team of analysts always keeps a close eye on average costs of materials and services in our service areas to keep our material prices and service rates customer-friendly. We handle each project with outmost care and professionalism – not just to ensure quality, but to build good and lasting relationships with our clients. 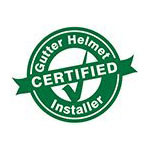 Protect your gutters with Gutter Helmet now! Call us at (800) 824-3772 or fill up our online form to get a free quote.